Sorry for the dim and dismal photo – so dark here now for so much of the day. I should have pre-planned better to take the photo in the mid-morning sunlight yesterday! Oh and lest I forget…do pop over to see Julia and the rest of the WOYWW crowd. Such fun and a day chock full o’ inspiration. Hope you’ve had a good week – those printables/links up in the other posts are fab, so thanks for the links to them! If I don’t speak to you again before (via WOYWW), Happy Thanksgiving! hope your daughter is better and that you’ve found some time to play. thanks for sharing! happy WOYWW! hope your poor daughter feels better soon. the page looks like it is going to be lovely. Love the “Life is so daily” peek that I got! I’ll be back to see it again. Sorry that your crafty time may be compromised! ;0) Hope she’s feeling better soon and you can get back to the fun stuff! I hope your dd is better soon. That sounds painful. Have a great WOYWW from (don’t ask how) #1 this week. You sound very busy!! Love the lay out so far, have a great day Happy WOYWW!! Hi there; thank you for sharing your place of creativity with us this week, it was great to pop in and visit. love the photo, and you will finish it! LOL me who has several unfinshed projects on the go! Great photo on your layout – really tells a story. Hope your daughter’s toe is better today. Love the eye charts, and the layout looks lovely. 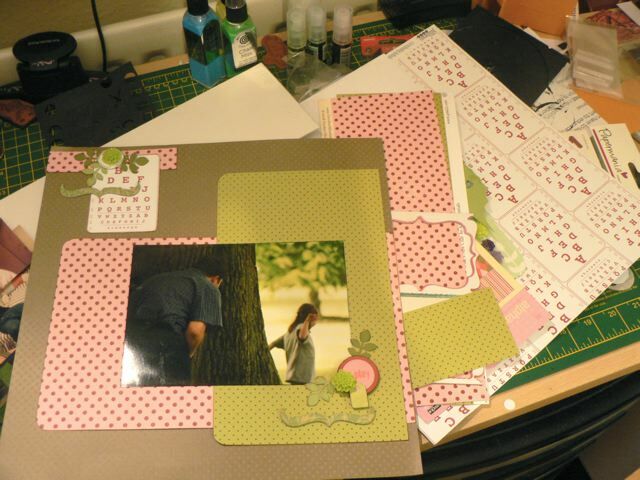 I love spotty (and also stripey) papers… and that layout will be so stunning when it’s completely finished! Here’s hoping your daughter recovers soon, and you get time to finish your project. In the meantime, have a fantastic WOYWW! Loving the spots and bright green – it’s a lovely LO in the make…hope you aren’t too over run today and can find some you time! Thanks for sharing today, Sarah at 2.